This set of Roll and Cover games are the perfect addition to your math station / math centre rotation. These Roll and Cover games can be played by students in partnerships, in small groups or they can even be played independently. These activities can also be offered to students as a part of their daily math work, as a centre or as a “fun when you are done” activity. I have also sent these games home with students to extend their opportunity to practice and reinforce their number recognition skills. 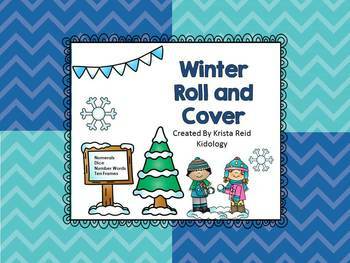 Included in this download are four winter themed Roll and Cover game boards. Each representing the numbers 1-6 in different ways. This pack also includes an extension worksheet that can be used as a follow up worksheet. There are four versions of the worksheet provided so that you can differentiate for your students. Please check out the preview to see an example of each game board and the worksheets. Did you know that you can earn TpT credits for future purchases. Simply follow the directions for providing feedback following your purchase and download and you will be given credits that you can use towards future purchases with TpT. Click the follow me button at the top of the screen to stay up to date with what's new and happening at the Kidology store!